The self-guided nature trail to Hickman Bridge is a short and moderate two miles round-trip. Great views of the Fremont River and Navajo Dome can be found along the Hickman Bridge trail. On a lifelong quest to visit all the national parks, I realized one year ago that somehow I had overlooked one. Having worked for the National Park Service for 15 years, I have seen many amazing places. When I pulled into the Capitol Reef National Park for a short weekend vacation with my husband, and to get my Passport stamped … WOW, I was blown away by what I found. Tucked away in the heart of red rock country in south-central Utah is a hidden treasure. Off the beaten path, hardy adventurers each year discover a landscape of cliffs and canyons, arches and bridges, slick rock and petroglyphs, and orchards — all within a massive 100 mile-long rock reef, known as the Waterpocket Fold. 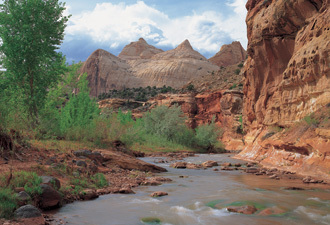 Capitol Reef National Park is a stunning treasure just waiting for discovery. After watching the park movie and chatting with rangers, I learned that almost 75 years ago, North America's largest continually exposed monocline, a geologic “wrinkle” on the earth, was set aside as a monument and 40 years ago was designated as Capitol Reef National Park. 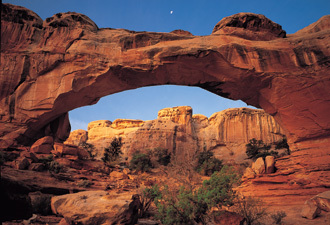 Rangers suggested a hike to Hickman Bridge, two miles round-trip, for amazing views and a closer look at the geology of the reef. The views on this hike were incredible! As we climbed the geologic wonderland, lizards and chipmunks scurried underfoot. The rich red Kayenta rock layer is littered with black basalt boulders transported down from nearby mountains by glacial outwash. We took in views of Capitol Dome, sculpted from white windswept Navajo sandstone, the largest dunes ever found on earth. What a delight to see Hickman Bridge against a beautiful brilliant blue sky. After the hike, we discovered more phenomenal sites. Large Fremont Culture petroglyphs, images of bighorn and anthropomorphs carved in rock date back to a culture that thrived along the river for almost 800 years. We stopped at a “U-PICK FRUIT” sign at an orchard and ate apples picked right off the tree. 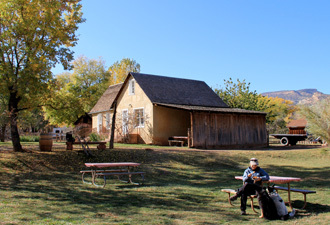 The park preserves one of the largest historic orchard systems of any national park, planted originally by Mormon pioneers who settled in the lush green community of Fruita in the 1880s. We then picked a lovely grassy site at the shady campground along the river. The ultimate discovery came while walking our dogs in the morning to the Gifford House next to the campground to find fresh baked fruit pies! We sat in pure delight eating peach pie under the red rocks. Capitol Reef is unbelievable. It's a hiker's paradise with stunning geologic wonders, wild natural landscapes, and a cultural story rich with petroglyphs, pioneers, and pie. I was hooked and wanted more, so now I work as a park ranger at the reef, and the pie never tasted better! Hike the dog-friendly trail from the visitor center to the Gifford House and eat pie with your furry friends — remember leashed pets are allowed only in developed areas! The park celebrates its 75th anniversary on August 2, 2012. Join us for the celebration! Find out more at www.nps.gov/care and at twitter.com/!#/CapitolReef.